After 10 years Windows 7 is coming to the end. After 10 beautiful years with Windows 7, Microsoft have said that its support will be stopped in January 2020. 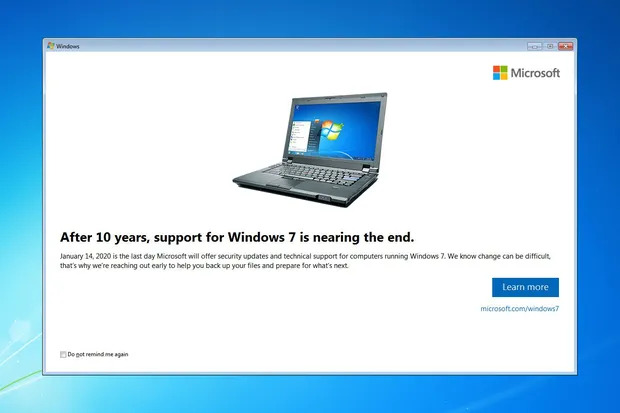 In the latest update for Windows 7, the pop up (pictured below) notified users that the support will be ending soon. According to Computerworld, 3.2% of all PCs in the market as of January 2019 still use Windows 7. These figures don't include PC's already owned. Continue to use Windows 7 as you are until the end of support date. Change to Linux or to Apple Macbooks / Mac desktops. If you choose to continue to use Windows 7, Microsoft recommends to make sure all updates are installed, you have a good Antivirus software installed and ensure your data is backed up. So what if you can't upgrade from windows 7 due to device limitations? If you can't upgrade due to hardware limitations, you could buy a brand new desktop or laptop from Microsoft or from a 3rd party retailer. All new laptops and desktops comes with Windows 10 Pre-installed. You could go to Apple with their Mac Series, Chromebook from google or you could do to Linux. The choice is up to you, but you only have until 14th January 2020 to work out what you want to do next. On the day of Windows 7's end of extended support, you will stop receiving updates for any Microsoft product on Windows 7 Which includes IE 7 , Office 2010 , Windows server 2008 and more. If you have decided to upgrade to 10, then you won't need to worry. But to those who still use the operating system, start saying goodbye. SO do you use Windows 7 or do you use Windows 10 or other operating system Let us know in the comments! I'm a Windows 10 User. I've been a windows 7 user for so long and now it feels different. Windows XP was amazing, Vista was garbage , 7 was fabulous. 8 was again trash same with 8.1 and 10 i'm living with it. They will soon change just like the XP group did. I cannot handle the flex.